24mm RDA Ystar Bad Boy RDA&Ystar Levante RDA Which One Is Yours? 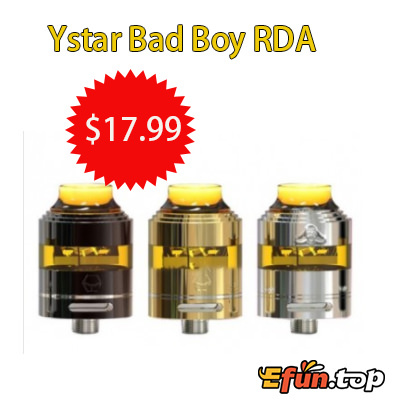 Ystar Bad Boy RDA is a revolutionary rebuildable RDA tank with 24mm diameter and beautiful design. The Bad Boy is an extremely easy single coil build tank which features a unique single column and postless build deck for easy building and wicking with larger e-juice capacity. With the unique airflow holes inside and adjustable bottom airflow, the Bad Boy RDA provides excellent flavor with huge cloud production. The airflow moves in a turbo-type inside to gather quickly and effectively prevent condensate into mouth. Together with an innovative cap with PEI build-in which provides excellent heat insulation, the Ystar Bad Boy RDA will bring you an incomparable vaping experience. 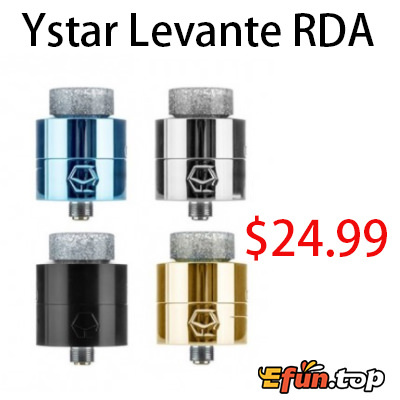 Ystar Levante RDA comes with a regular 510 pin and a bottom feeder pin to refill e-juice with squonker MODs. The tank is 24mm in diameter with unique compression-style posts. The Levante RDA adopts built-in PEI barrel for heat insulation, bringing a cooler vaping experience! The 810 Acrylic drip tip makes the Levante a sparkling device too. Just get this delicate tank for optimal flavor and massive clouds!